Kathmandu, Nepal’s capital, is home to 700,000 people. When its satellite towns, Patan, Thimi and Bhaktapur, are taken into account the population rises to 2.5 million. Kathmandu is located roughly in the centre of Nepal. The Everest region is found about 100 miles to the east, Pokhara about 100 miles to the west, and the Chitwan National Park around 50 miles to the south-west. New Delhi is the closest major city, about 600 miles to the east of Kathmandu. 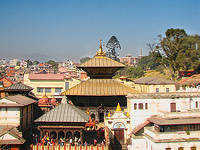 Kathmandu is found at an elevation of 1,400 metres above sea level. It has eight rivers flowing through it, the most famous of which is the Bagmati. The surrounding Kathmandu valley, enclosed on all sides by Himalayan foothills creating a bowl, is extremely fertile farming land. The major religions are Hinduism (80% of the population) and Buddhism (15%). Whilst Nepali is the official language, English is spoken and understood by about 90% of the population. Seven of Kathmandu’s monuments are included within the UNESCO world heritage citation for the Kathmandu valley. They are the Durbar Squares of Kathmandu, Bhaktapur and Patan; the Swayambunath and Boudhanath Buddhist stupas; and the Pashputinath and Changu Narayan Hindu temples. The Himalaya can be seen to the north of Kathmandu. On a clear day, those with binoculars should be able to make out Manaslu, Sisha Pangma, Cho Oyu and Everest. Kathmandu is in time zone UTC + 5.45 hours. So, when it is noon in London, it will be 5.45pm in Kathmandu. The currency is the Nepalese rupee, and the dialling code is +977. Kathmandu and Nepal are now beginning to recover from the devastating April 2015 earthquake, and need the funds generated from tourism more than ever. 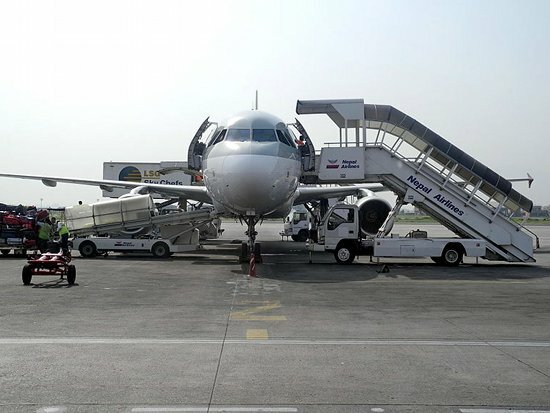 Those arriving by air will land at the Tribhuvan International Airport, about 5.5 kilometres from the city centre. Flights. 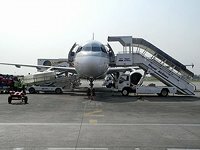 Flights to Nepal are offered by a number of international airlines, the best of which are Etihad, Jet, Thai and Qatar Airways. Most flights—even from international hubs such as London, Paris and New York—will require you to change, usually at Doha, Abu Dhabi or Delhi. Don’t store valuables in checked luggage, which has been known to be forced open, and watch out for assertive ‘airport baggage cart collectors’ (who will demand a fee for their services, whether welcome or not). Road travel. It is possible to get to Kathmandu by road from Delhi, Darjeeling, Calcutta or Tibet. But the journey typically takes a couple days and the conditions on Nepalese roads are not good. Nepal has no meaningful railway system. So we recommend arriving by air. Kathmandu’s weather is fairly temperate. Temperatures. Temperatures between April and October range from highs of about 28 degrees Celsius to lows of about 13 degrees Celsius. Even in the winter months, average lows do not drop below 2 degrees Celsius. 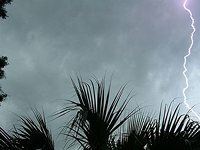 Monsoon. Then there is the monsoon, which dumps over 1000 mm of rain on Kathmandu between June and September. 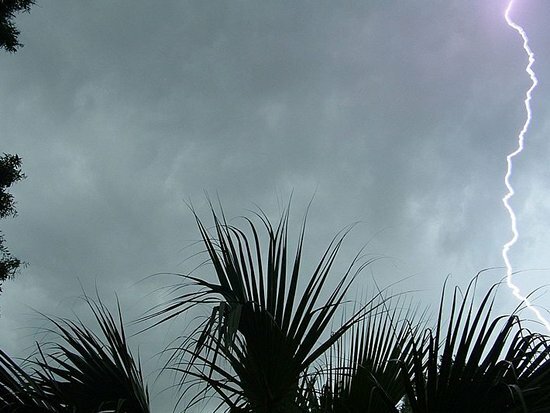 During the year’s other eight months, average rainfall is about 300 mm, meaning that Monsoon season accounts for about 65% of annual precipitation. Trekking. Peak trekking season is between October and early December (after the monsoon and before it gets too cold) and then again from March to April (after the temperature improves and the snow has melted, but before it gets too hot). 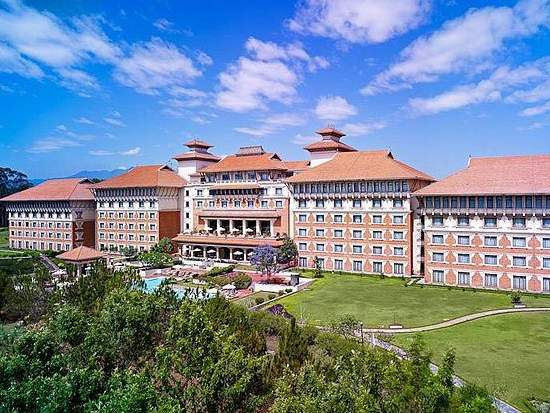 These days, Kathmandu offers even the most discerning travellers a range of five-star options. Five star. The Hyatt Regency is probably the most sumptuous hotel in town, with extensive gardens, wonderful architecture, a spa, gym and selection of restaurants. The Yak & Yeti is the oldest and most famous in the luxury band, though some say it has seen better days. Also in the five-star bracket, the smaller Hotel Tibet International, Dwarika’s Hotel (a converted Newari palace) and the Royal Penguin Boutique Hotel all offer excellent service. Prices for five-star hotels start at about $100 a night and can be as high as $500 per night for a suite in high season. Three star. In the three-star category, you can get a very good room for about $50-70 per night at the Hotel Friends Home (a friendly hotel with good breakfasts and clean rooms), the Shambaling Boutique Hotel (close to Boudhanath, with a peaceful garden and attentive staff) and the Gaju Suite Hotel (a small hotel offering great breakfasts and five-star service). Budget. There are plenty of more budget options available, particularly in Thamel. Some of the smaller establishments, such as the Pagoda Guest House in Bhaktapur, make you so welcome that you feel like part of the family. 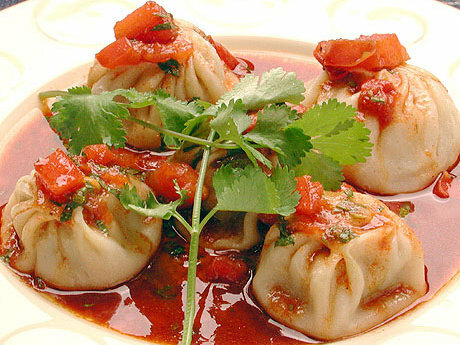 Kathmandu offers a wide menu of food options. At one end of the spectrum is traditional Nepalese fare, such as dal-bhat-tarkari (rice, lentils, vegetable curry and chutney) or momos (Tibetan dumplings with Nepali spices). At the other end, haute cuisine is offered by a number of high-end international restaurants. Nepalese. For Nepalese food, we suggest Bhojan Griha (with a $20 menu, and offering a traditional dining room in an 18th century restored mansion in Hilli Bazaar). 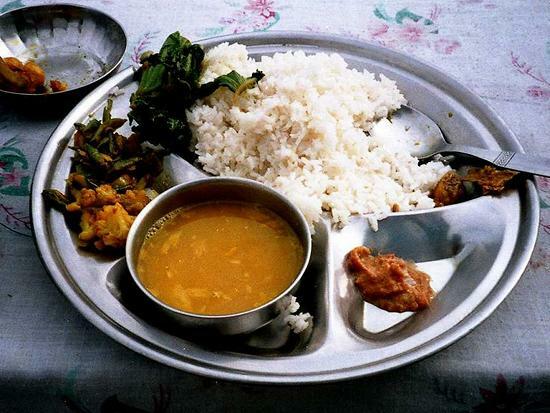 Good value Nepalese food is also served at the Thamel House, Yak and Mitho Restaurants. Italian. For Italian good we suggest the Roadhouse Café (for wood fired pizzas and Illy coffee), Fire & Ice (great pizzas and ice-cream in informal settings) and La Dolce Vita (a higher class joint, ideal for special occasions, serving great gnocchi and cannelloni). World cuisine Thai food is served at Yin Tang (with lovely al fresco dining in a courtyard), Japanese food is dished up at Koketsu (close to the Japanese embassy) and Mahaaja (try their tofu with salsa), Tibetan food at the Yangling restaurant (momos are a speciality), Spanish cuisine at La Casita De Boudhanath (serving up wonderful tapas and churros), Middle eastern cuisine at OR2K (an Israeli-run vegetarian restaurant, with great meze), Korean cuisine at Hankook Sarang and French haute-cuisine at Delices de France. A lot of Kathmandu’s restaurants decide not to specialise. The Northfield Cafe, for instance, offers American, continental, Mexican and Indian food (and free wifi!). Kilroy’s is another joint serving great international food. On 25 April 2015, an earthquake measuring 8.1 on the Richter scale hit central Nepal. It killed over 9,000, injured 23,000 and caused in excess of US$5 billion of damage (about 25% of Nepal’s GDP). In addition, the earthquake triggered an avalanche on Mount Everest, killing 19 people – the most ever to have perished on the mountain in a single day. The immediate human cost of the earthquake was extreme: villages were flattened, thousands of houses were destroyed, people in remote areas were cut-off from relief efforts, and sanitary services were severely affected. Things could have been even worse: the epicentre of the earthquake was 81 kilometres west of Kathmandu. Tourism, which makes up 25% of Nepal’s economy, was initially badly hit. Holidays were understandably cancelled and tourists in Nepal left as soon as they were able to arrange a flight. Several important monuments, such as pagodas on Kathmandu’s Durbar Square, and important temples in Patan and Bhaktapur, were demolished. The most significant loss was the collapse of the 183 year-old Dharahara Tower, whose nine-stories had previously watched over Kathmandu. On the other hand, the world-famous Boudhanath, Pashputinath and Swayambhunath Temples more or less survived. Fortunately, the world responded with an unprecedented relief effort. The UK’s contribution—US$130 million in total, US$79 million generated by public donation—was particularly generous. In addition, extensive works are underway to rebuild or repair the monuments damages by the earthquake, though it is estimate that it will cost US$200 million in all. Should tourists still visit Nepal? The UK foreign office does not advise against travel on the basis that Nepal is at earthquake risk, though it does recommend familiarising yourself with safety procedures in the event of an earthquake. 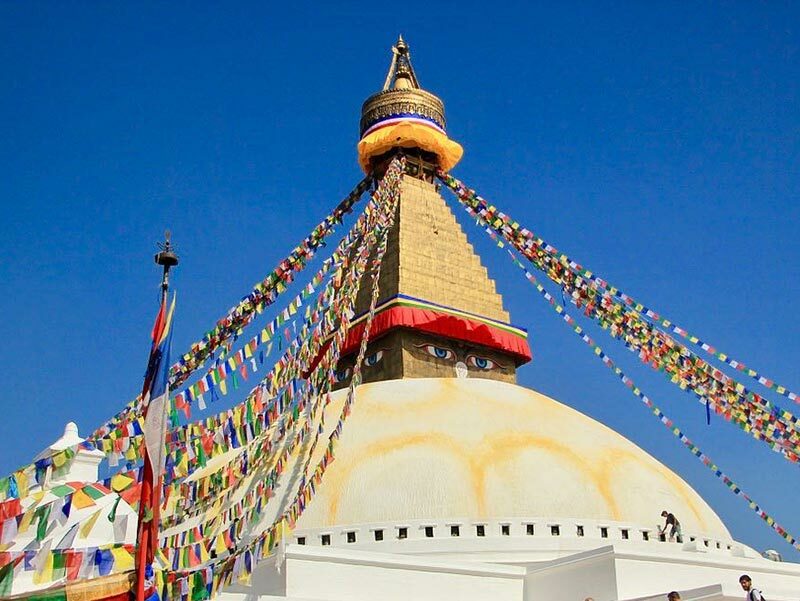 On 15 October 2015, the Nepali embassy in Beijing and over 100 tour operators issued a joint press statement with the hearding: Nepal is Safe to Visit. 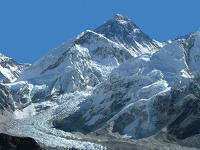 More welcome news for the Nepalese tourist industry emerged on 11 May 2016, when nine Sherpas summitted Everest. This was the first successful ascent since the earthquake and was particularly significant as the Sherpas laid ropes and equipment for the busy May climbing season. This success was swiftly followed on 12 May 2016 by the successful ascent of three foreigners—including British climber Kenton Cool, who ascended for the 12th time—together with their three sherpas. In 2016, the Nepali government issued almost 300 permits to climb Mount Everest. 2017 was a year in which tourism returned to Nepal. This led the Nepalese government, in October 2017, to declare that 2018 would be "Visit Nepal Year"